This Architecture note is the third of three notes discussing “Sequences”; the heart of our Technology Maturation and Engineering Validation process. This process is the source of our technical and intellectual fuel. Many of the early Sequence steps will be repeated until we “get it”; and further repeated until we “get it right”. Getting it right is the essential definition of our perseverance to build the Space Elevator. Let’s talk about the 6rd, 7th, and 8th steps in the Sequences. ISEC is completely confident that the design of Space Elevator Transportation System IOC will be validated by execution of the first five Sequences. 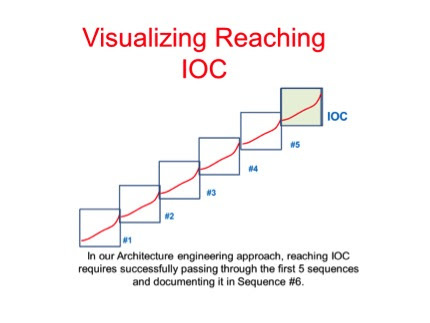 In our Architecture engineering approach, reaching IOC requires successfully passing through the first 5 sequences. The 6th Sequence is documentation of the test data that all parts of the Space Elevator operated properly. It will show that the Space Elevator operates as designed; with safety and surety. Reaching IOC will show that the Space Elevator can be well monitored, and is in communications contact with the Space Elevator command center. Reaching IOC, as shown in the figure below, should be viewed as a culmination of 5 successful testing and documentation phases; and that the system has a strong engineering foundation. With the Space Elevator Transportation System in place at IOC, an inexpensive, reliable, and robust transportation becomes a valued part of all on orbit activities. These activities are a wide set of business entities. Businesses will be ready to use the Space Elevator; but only after key support functions are added to the bare transportation system. These functions – services really – will be identified well before IOC, but added to the Architecture after IOC; and added in a prescribed manner. That prescription is Sequences #7. The Space Elevator post-IOC activity will feature a formal process by which we add more functionalities. Improved versions of the IOC functionalities might be added; and/or new Space Elevator functionalities will be added to support our client’s businesses. We will conceive how these functionalities can meld into the operating Space Elevator Transportation System without loss of effectiveness or safety. In practice, functional additions will be in three categories More; Better; and then New. Whatever is to be added must meet the same engineering standards that the Space Elevator Transportation System achieved. 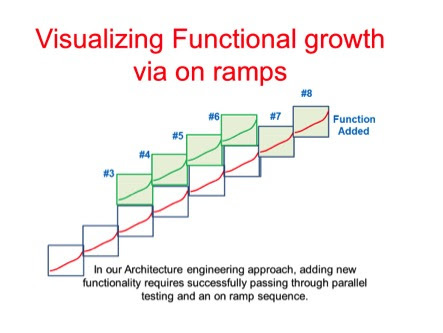 The added functions will progress through the Sequences via parallel on ramps; eventually merging … as shown here. Adding new functions or services to the Space Elevator requires that the new capability successfully accomplish early sequences and go through a parallel operations period in Sequence 7. By notion, we see that as “getting up to speed”; like we all do getting on the freeway. The Sequence approach also allows ISEC to wisely time when “more”, “better”, or “new” should enter and then join the Elevator. A good (pre-IOC) example of that is the consideration of when the second tether becomes operational. The sequenced approach simplifies that consideration. The second tether will follow the first tether. How closely it follows the first tether is a matter of judgment; at that time. Other functions & services would be inserted in the same way. ISEC expects that positioning, propulsion, refueling, and other functions would be added modularly to the GEO Node. As noted above, the timing of those additions / insertions is a matter of judgment; based on how well the addition / insertion is faring on its journey through the Sequences. The visionary aspect of the Space Elevator Enterprise includes tourism, interplanetary travel staging, hospitals, factories, power generation, and a multitude of operational support services. That is a huge vision. In fact, we could consider that FOC is never reached! The Full Operational Capability vision of the Space Elevator will expand with time and be achieved by constant expansion via the “more”, “better”, or “new” paradigm cited in the on-ramp sequence. The basis of each expansion will be the foundational engineering maturation achieved by progressing through Sequences. ISEC envisions any number of Space Elevator enterprises. They might be for tourist transportation, industrial complexes to collect power & water, factories to mine exotic materials, or assemble craft for intergalactic exploration and travel. Adding capabilities to match these visions will require the same level of engineering persistence needed to build the first Space Elevator; and Sequences will always be part of it. ISEC sees a Space Elevator Transportation System beyond the IOC, and a Space Elevator Enterprise as an Architecture that matures through each step of the Sequences and presses on to the future. Sequences offers the enabling steps for the Space Elevator to grow beyond our dreams. Indeed. See you next month.